:) Use this Monopod for digital, video and film cameras . :) Lightweight and Durable . :) Extends to height of 63 inches. :) 6-section screw leg-locking system for secure height adjustment . :) Foam hand grip for comfort and stability . :) Monopod closes to a compact size of 15 inches. Monopod + Three Feet Support Stand Max Height :1600mm (63"). 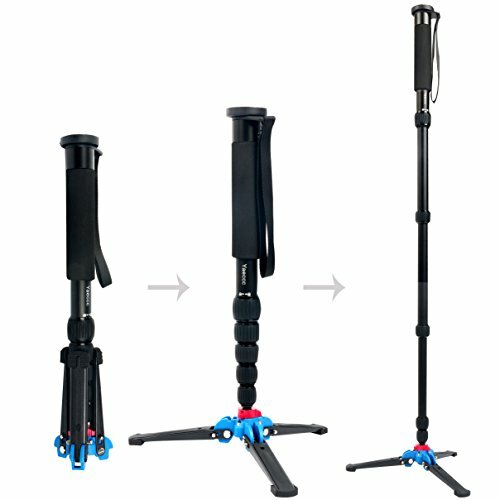 Monopod + Three Feet Support Stand Folded Length: 420mm (16.5"). Monopod + Three Feet Support Stand Net weight: 680g . Reversible 1/4"-20 & 3/8"-16 screw on the mounting plate. Extends to height of 63 inches , 6-section screw leg-locking system for secure height adjustment. Foam hand grip for comfort and stability ,Lightweight and Durable. Use this Monopod for digital, video and film cameras .